I had company in town this week and needed some easy dinners that could be prepped ahead to maximize our time exploring our area. 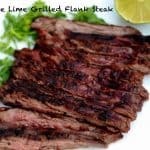 Flank steak is always a big hit with guests! I was able to whip up this quick marinade the night before, and have dinner almost completely prepped after a full day out. 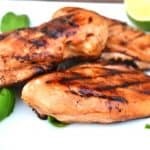 Although it’s not the best cut of meat, if it’s grilled right and has a delicious marinade, it’s fantastic. 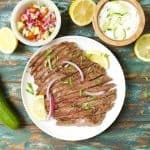 The secret to grilling this particular delicious flank steak is to use the discarded marinade as a sauce. I used chipotle peppers in adobo sauce which are easily found in most supermarkets near the mexican food. Those of you who avoid spicy foods should not worry. It was hardly spicy at all, and all 4 kids cleaned their plates. You’ll want to marinade the steak for at least 8 hours, but up to 24 hours. 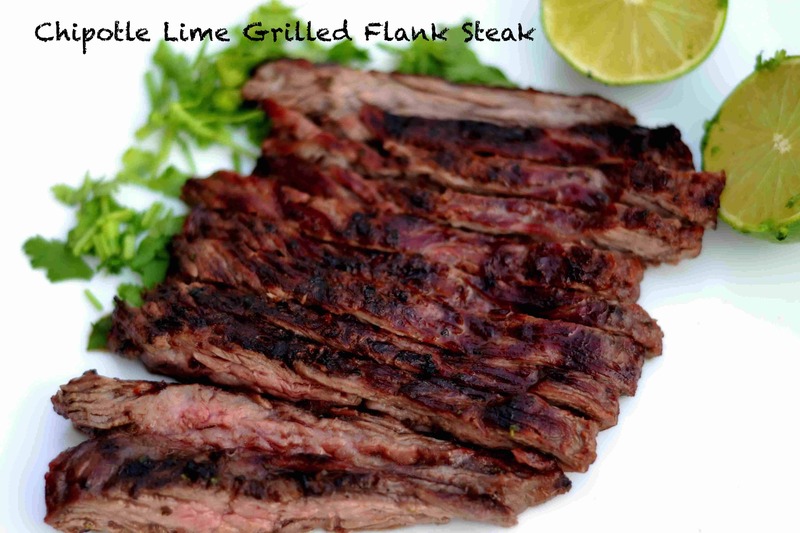 Once the flank steak is on the grill, heat up the discarded marinade to a boil, an then simmer for around 10 minutes. Combine the oil and rest of the ingredients in a food processor or blender. Pulse until the peppers and cilantro are smooth. 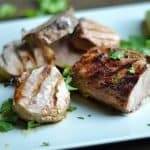 Place marinade in a large ziploc bag. Add large flank steak and mix the marinade around to completely coat the steak. Marinade for at least 8 hours, but up to 24. Grill large steak for 5-10 minutes per side (5 minutes for rare meat, 10 for well done). While steak is grilling, add marinade to a small saucepan. Bring to a boil and let simmer for 8-10 minutes. Cut the steak across the grain into thin diagonal slices. Serve steak with the marinade sauce. What else do you serve with this steak? I’m glad you asked! I served it with my black bean quinoa salad (posting recipe soon). 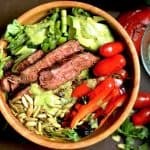 But, a mexican style salad or any type of rice would work well! Made this last night and it was AMAZING. Added jalapeños and garlic and it was incredible! Thanks Michelle! Glad you loved it! Agreed. A little siracha helps too. Test drove this recipe lSt weekend and it was FANDAMTASTIC! Thanks for sharing, not to be nit picky. But the chipotle peppers come in Adobe sauce not Adobe sauce. Thanks Rod! And I think you had the same problem I did. My computer auto-corrects to adobe instead of Adobo. I just changed the recipe, and never noticed until now! haha!